How does it differ from a modern PC? At the time the PDP-8 family started out, there were great difficulties with memory. Core memory (RAM) was very expensive and generally very limited. ROM was limited to a very few bytes and usually consisted of a diode matrix. The contents of ROM could be changed by removing diodes with a pair of cutters or soldering in new ones. When a PDP-8 is first turned on it contains NOTHING, there are no instructions built into the machine to tell it about paper tape readers or teletypes, it is completely empty. On machines such as this, there has to be some other way of getting instructions in and then starting the execution of those instructions. This is where the programmer's console comes in. The console is mounted on the front of the machine, below the processor & memory. It consists of an array of indicator lights and switches. Twelve toggle switches provide a means of setting up a 12 bit word and entering it to the machine. A "1" is set when a switch is up and a "0" when it is down. This key is spring biased in the up position and acts as a push button. This key starts the machine running when pressed. The processor takes its first instruction from the location pointed to by the Program Counter (PC). This is the Load Address key. When this key is depressed, the contents of the switch register are transferred into the PC. The programmer's first task when entering a program is to set up the starting address for the program. The DEP key (Biased down). This is the Deposit key. When lifted, this key transfers the contents of the Switch Register (SR) into the Memory Buffer (MB) and so into core memory at the location pointed to by the PC. The contents of the PC is then incremented by one. All that is necessary to store the next instruction is to enter it on the SR and raise the DEP key again, and so on. The Deposit key is biased in the opposite sense to the other keys to avoid confusion when working quickly. This is the Examine key. Pressing this key sets the contents of the memory location specified by the PC into the MB and the Accumulator. The contents of the PC are incremented by one. This allows sequential memory locations to be examined by repeatedly depressing the Examine key. Depressing this key allows program execution to continue after it has been stopped. Depressing this key stops the processor when it reaches the end of the current cycle. This is the Single Step switch. If this switch is UP, then the processor will stop at the end of each processor cycle. Depressing the Continue key will execute the next cycle and so on. When this switch is up, repeated operation of the Continue key will step through the program one instruction at a time. ...the indicators, mounted on the panel just above the switches. The twelve Program Counter indicators show the contents of the PC. When the machine is stopped, the content of the PC indicates the address in core memory of the first instruction to be executed. 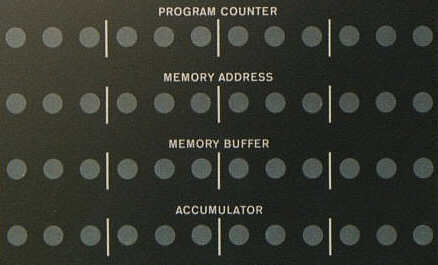 The twelve Memory Address indicators display the contents of the MA buffer. After operation of the Deposit or the Examine key, the MA indicators show the memory address at which information was just written or read. The twelve Memory Buffer indicators indicate the contents of the MB, the contents of the core memory address pointed to by the PC. The twelve Accumulator indicators display the contents of the Accumulator. This combination of switches and indicators allows the programmer to enter a program and data, to run or step through the program and to check the working of the program by examining memory locations or the machine's registers. zero, then skip over the next instruction. All this program does is add one to the accumulator, then it counts from 0 up to 4096, then it adds another one to the accumulator and so on ... The adding up to 4096 is sufficient delay so that the higher order accumulator lights can be seen to be switching on and off rather than just flickering rapidly. Set 0020 (the start location) on the switch register and depress LOAD ADD key. Set 7001 on the switch register and raise the DEP key. Set 2034 on the switch register and raise the DEP key. Set 5021 on the switch register and raise the DEP key. Set 5020 on the switch register and raise the DEP key. The program is now loaded. Before it can be run, the start address needs to be set. Set 0020 on the switch register and depress the LOAD ADD key. The accumulator lights start changing and the program will keep running until the STOP switch is depressed. If the computer is turned off, the program will still be in memory when it is next turned on and may be run again. Core memory doesn't require power to hold its contents. How do you enter 7001 or 2034 onto 12 switches when the biggest 12 bit number is 4096? Firstly, there is no direct correspondence between decimal numbers and binary. For instance, 01 decimal is 000�001 binary and 10 decimal is 001�010 binary. The decimal 1s represent 001 in each case but the decimal zero represents 000 or 010. From a decimal number it is possible to calculate the equivalent binary, but the decimal representation does tell us directly what the binary looks like. But, secondly, if we look at the OCTAL, a "1" always corresponds to "001" and a "0" always corresponds to "000". This is true for all octal numbers. An octal "7" always corresponds to the binary 111, irrespective of its position value. An octal number, therefore, gives a good picture of the appearance of a binary number as well as representing its value. Octal numbers are, therefore, a good shorthand way of writing binary numbers. This is especially true when it is possible to divide the binary into columns of three, ie with 12, 18, 24 or 36 bit machines. DEC used octal to portray the binary for the PDP-8 series and the numbers for the program codes are written in octal. It is not so appropriate to use octal with more modern machines, which tend to be based on multiples of 8 bits (16, 32 & 64bit machines); here the horrible hexadecimal is more suitable. It is easy to do the conversion from octal to binary in your head (you only have to remember eight different things and one of those is 0). The control panel switches are coloured in groups of three to help with the conversion. The pdp-8 has a fairly reduced instruction set. The first three bits of the instruction word specifies the OP-code, so there can only be eight basic instructions. The PDP-8 handles memory addressing in its own sweet way, (it's almost as weird as the 80x86). Because of the limitation of the word length (12 bits), and the need to use three bits of the word for the instruction code, that leaves only 9 bits for a memory address. The PDP design gets round this by dividing memory into 32 pages of 128 words per page. To address the contents of a page then requires 7 bits. This leaves 2 bits. These are used to handle paging and indirect addressing. The indirect addressing uses locations in page zero to hold absolute 12 bit address pointers, and so all memory locations can be accessed. What follows ignores indirect addressing and just deals with addressing on a single page. This illustrates the principle without the complication. Just remember, for instructions 0 to 5, three bits hold the instruction, two bits do something else and the last 7 bits of the instruction word contain an address. In the blurb below, this address is referred to as Y. Instructions 6 and 7 do not address memory and the last 9 bits of their instruction words are defined differently (see the table). Logical AND. The content of the memory location Y is bitwise ANDed with the accumulator and the result stored in the accumulator. Two's complement add. The content of the memory location Y is combined with the accumulator by two's complement addition. The result is stored in the accumulator. Increment and skip if zero. The content of the memory location Y is incremented by 1 and restored to memory. If the resultant content of Y is now zero the PC is incremented by 1 causing the next instruction to be skipped. Otherwise, the PC is unaltered and the next instruction is executed normally. Deposit and Clear the Accumulator The content of the accumulator is stored in memory location Y and the accumulator is set to zero. Jump to Subroutine PDP-8 subroutines are handled differently to the way they would be today. The PDP-8 has no stack and no registers in which to store the return address, so the JMS instruction writes the return address into the first word of the subroutine code and starts execution from the second word. To return, a jump is made using the stored return address. Operate Vaguely named and difficult to describe briefly. There are two groups of operate instructions, depending on the value of bit 4 of the instruction word. The remaining eight bits of either group each correspond to a particular operation, so if a bit is set the action specified for that bit is taken. The beauty of the operate instruction is that if say two bits are set, then one instruction will initiate two actions. Eg, the code 7001 will increment the accumulator. The code 7040 will complement the accumulator. The combination of these codes, namely 7041, will complement and then increment the accumulator. The operate instruction covers a host of different actions, shifting, clearing, complementing, conditional jumps.